RC Corrocare's offers Concrete Polishing Services to commercial markets. Polished Concrete adds both durability and clean appealing looks to concrete floor surfaces. 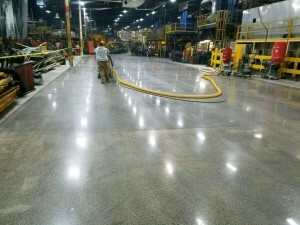 The concrete polishing process begins with grinding the concrete with varying grits in our special diamond grinders resin pads. These pads provide the flexibility of finding the right shine, reflectivity, and durability characteristics to make the floors beautiful. We also use chemicals as part of the mechanical element while concrete polishing. Concrete densifiers and hardeners are used to help fill the concrete pores while increasing the hardness and strength of the concrete slab. There will be some concrete restoration that takes place during the polishing process in order to bring worn out divots and crumbling parts of the floor back to life. After the restoration is complete, you could also choose to have the concrete stained if you were looking for a more decorative look. What Are The Benefits of Polished Concrete Floors? When a forklift burns out on a coated floor the friction caused between its tire and the concrete surface leaves a mark. This does not occur on a polished concrete floor because there are no resins to burn on the concrete’s surface. Whether you have a bunch of forklifts running around the shop, industrial mold injection machines, or commercial ovens, epoxy floor coatings will provide you the strength needed to ensure a good hard days work. Our epoxy systems are designed to go over new or existing concrete floor surfaces. Contact us for more information about our concrete polishing services and receive a free professional consultation.